Neil Gaiman is a master storyteller. This collection made my heart soar, it made me laugh, tear up, shiver with fear, and double check to make sure my front door was locked to keep out creeping shadows. 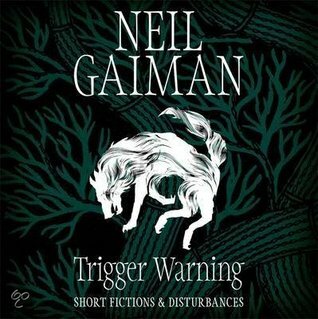 There are dozens of stories in Trigger Warning, ranging from a minute or two in length to over an hour. I listened to the audiobook version which was narrated by Gaiman himself. This was excellent, but occasionally confusing when switching between very different protagonists. For example between a young boy and then the Queen in Sleeper & the Spindle. But I just took a moment or two to reset between each story and that solved the problem. There were some stand-stories in the collection, as there is bound to be, and it is very hard to review all of them in one sweep because they are quite different. The introduction in particular is worth a read. In it Gaiman talks about the title of the book, posing the questions: Are stories safe places? And should they be? His argument is that life is not a safe place, not a place that comes with warning labels to help us through the things that might hurt us. So in-fact stories can help us to experience things outside our comfort zone, to tiptoe around the edges of things that scare us, or just plunge right in. There are so many wonderful characters woven throughout these tales, and it is the kind of book that I will look forward to reading again in the future, dipping in and out of the various stories. I can’t wait to read another of Neil Gaiman’s books, his whimsical yet dark style is a study of contrast and masterful storytelling. Always a pleasure to read.